Richard Sharp (1759 – 1835), born in Newfoundland, was a hatter and later prominent merchant in London. He was also a Dissenter, becoming the champion of adult education. His powers of persuasion were responsible for establishing the forerunner of the University of London, the London Institution, open to scientific scholars who were denied entrance to Cambridge and Oxford because of their unorthodox religious beliefs. Richard "Conversation" Sharp - he quite looks like Geoffrey Rush, does he not? Delightful man. 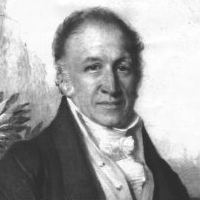 Lansdowne House, along with its rival Holland House, drew Sharp into its orbit not only for these accomplishments, but because of his conversation. London was filled with good conversationalists. Town wits, they were called, frequently evaluating one another and publishing their findings in essays and other periodicals for the delectation of the ton. Byron (1788 – 1824) was a notable practitioner of the art–his poetry the vehicle for satirizing other conversationalists. Wordsworth was frequently a target for his notions of solitude and the love of the sublime. But when it came to describing Sharp, Satire completely failed her master, giving way to her cousin, the Simple Truth. Indeed, this is where we find not just the good, but the best. Richard Sharp remained single all his life. Yet he was moved to adopt a little girl, orphaned in a volcanic eruption in the West Indies. He never wanted to be remembered after he died. This entry was posted in Regency and tagged byron, Lansdowne House, London Institute, Regency, Richard Conversation Sharp, University of London, Wordsworth by Angelyn. Bookmark the permalink. Thank you for posting this. I have a great interest in the Whigs and all my characters are in that party. It is pure serendipity my fascination with Lansdowne House led me to the Whig party. I hope I can provide some inspiration and helpful research for you with these little posts. Quite interesting. As usual, thanks for an informative post! You are so kind, Ashley. He does look like Geoffrey Rush. LOL! I’d love to spend one evening listening to such conversations. Cultured tones, refreshing vocabulary, thoughtful prose – I imagine it would be quite an evening! Well, I think it helped to have the Hermaphrodite around. And I adore Geoffrey Rush. He quite elevates Pirates from the amusement park ride it was really meant to be. These details form only a small part of this man’s remarkable accomplishments, but it is good to see him being publicised in this way. His incredible life-story should be better known – it is surely the stuff of plays, dramas, films and operas. The image is the only one of him known to exist. Is it too much to say that he was a genius ? See his full biography in the British Library or a précis on Wikipedia at https://en.wikipedia.org/wiki/Richard_Sharp_(politician) . I agree–it Is difficult to find a comprehensive biography on the man. Such a reference would be an invaluable resource for writers focused on the Regency era. There are few copies in the US, try Davis University. Newfoundland has several in their state libraries. I’m requesting the Davis copy through inter-library loan. A pity I can’t get a copy of my own.